The worst way to start a new relationship of any kind is with a lie. I think most people would agree with this observation. Yet there it was, front and center and about as subtle as a cockroach on a white rug, at the introductory news conference the Texas Rangers held for their newly signed pitcher Yu Darvish last Friday. Talk about the height of insincerity. Well, a funny thing happened last month shortly after the posting process for the ace of the Hokkaido Nippon Ham Fighters had begun. Tokyo sportswriters began receiving telephone calls from Darvish’s Tokyo-based agent, Don Nomura, who it appeared, had an agenda. Nomura, it seemed, was trying to dissuade certain teams from bidding on Darvish by floating a story that he would only play for teams located on the West Coast. It was a tale then even Walt Disney himself could not have dreamed up. The Seattle Mariners, San Francisco Giants, Oakland Athletics and San Diego Padres are not big spenders on free agents, the Los Angeles Dodgers were in bankruptcy, and the Los Angeles Angels had just broken the bank to sign Albert Pujols. Why did Darvish want to play for a team on the West Coast? Maybe he thought the environment there would make adjusting to life in the United States easier. Fair enough. But the reason is really irrelevant. When you put your name up for an open bid, like the current posting system requires, you take your chances. You don’t try to manipulate matters after the fact. 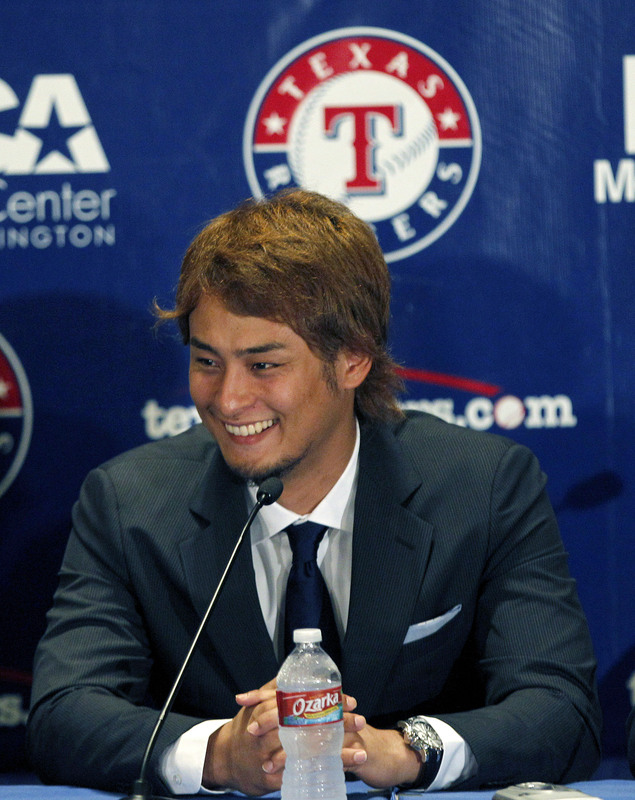 The humor behind Darvish proclaiming that he wanted the Rangers to win the bidding for him was only exacerbated at the news conference when he could not remember who Texas lost to in the 2011 World Series. It was the St. Louis Cardinals. MLB Network analyst Harold Reynolds said last month that he didn’t think Texas would be a good place for Darvish. Reynolds had a point. There were more home runs hit at the home stadium of the Rangers last season than any of the other 29 MLB teams. Perhaps this was one of the real reasons that Darvish wanted to stay on the West Coast. 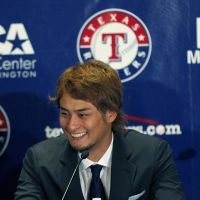 Darvish could have rejected the offer by the Rangers, returned to the Fighters, and then hoped a West Coast team signed him when he became a free agent. In the end, the offer from the American League champions was too good to refuse. Do I think Darvish has all of the physical tools to be a success in the majors? Absolutely. He is clearly a very gifted player. But it takes a lot more than a good fastball and good looks to succeed in the big show. You have to know how to interact with your teammates, the organization you play for and the media. You get the feeling that Darvish doesn’t exactly have his act together off the field. A divorced father of two at 25, which is very unusual in Japan, he seems to have a sense of entitlement when it comes to others. Now this is not entirely unusual in professional sports, because many of the athletes have been told how great they are from a very young age. The key is being able to separate the wheat from the chaff as you mature. One incident many local foreign sports media have not forgotten was his refusal to accept his Athlete of the Year award in person from the Foreign Sportswriters Association of Japan back in 2008. Darvish had won the honor for his outstanding season with the Fighters in 2007. When the group contacted the team to arrange for Darvish to attend the FSAJ dinner to receive his award, it was stonewalled by the pitcher’s handlers. The team was then informed that each previous winner had personally appeared to accept the honor. Kosuke Kitajima (2005), Mao Asada (2006) and Shizuka Arakawa (2007) had all shown their appreciation by attending the event and spending an evening with the group. As if that wasn’t enough, just a month before Darvish was invited, none other than the legendary Sadaharu Oh, who was still recovering from surgery for stomach cancer, had attended an FSAJ event to accept a Lifetime Achievement Award. Even that wasn’t good enough. “Can’t you just bring the trophy to the stadium?” came the reply from the team. Despite being given multiple dates to collect his award, Darvish never showed up. It was absolutely disgraceful and smacked of narcissism. The bottom line here is that it is time for Darvish to grow up and stand on his own two feet. Be honest, accept responsibility and show some respect to others. A touch of humility just might be in order on occasion. I’m afraid that the Osaka native is going to find out that the North American media are not going to be as gullible as the majority of their Japanese counterparts. If Darvish doesn’t shoot straight with them, the gloves are going to come off pretty quickly. If and when it happens, it will be interesting to see if he steps up and handles it like a man, or hides behind his coterie of protectors.